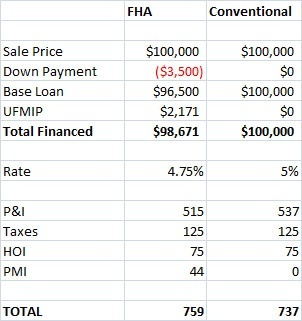 Can’t Save the 3.5% for an FHA Loan? Can You Save ZERO? It’s back and in style, the true Minneapolis and St Paul MN zero down payment program. For a few years now, the most minimum down payment you can do is 3.5% with FHA. And FHA has had its fair share of hurdles, from appraisal issues to a pretty major upfront mortgage insurance premium that you finance over the term of your loan. I am not bashing FHA. It’s a great program. I am here to say that there just may be a better one now! Okay, so the difference isn’t eye-popping, BUT, your payment IS lower, out-of-pocket for down payment IS lower and you could actually bump up your buying power by about $4000. And yes, this WILL make a difference. So what’s the skinny on this new, better-than-sliced-bread program? See below!